This summer we decided that, rather than going on a main holiday abroad (after all we have already been to Australia this year! ), we would explore more of the UK. 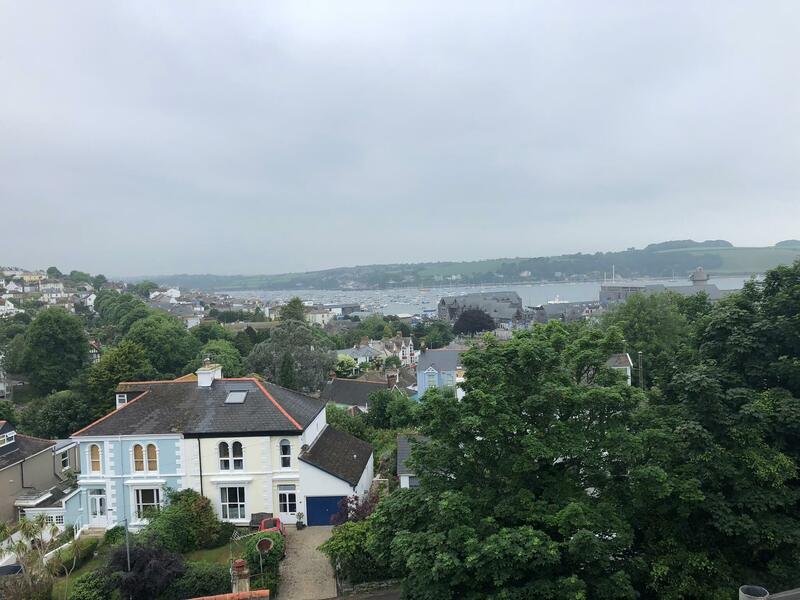 We absolutely fell in love with Cornwall when we visited the county last year and so I was absolutely delighted when we were invited to visit Falmouth by Cornwall 365. Cornwall 365 is dedicated to promoting Cornwall as a leading destination for culture, the arts and heritage and they have published the Find & Seek book – an illustrated atlas of Cornwall’s culture and heritage – which you can use to plan your trip and record your own adventures. Although I’d visited Cornwall before, I’d never been to Falmouth and so I was pleased to see things I hadn’t seen before. Here’s my guide to things to do, where to eat and where to stay in Falmouth. Falmouth is a university town and so there’s plenty going on here. There’s a great atmosphere about the town – it’s arty and bohemian with some lovely independent shops and some great bars. Here are some of the things we got up to during our stay. On our first day, we went outside of Falmouth and visited the Tremenheere Sculpture Gardens near to Penzance and about 50 minutes’ drive from Falmouth. 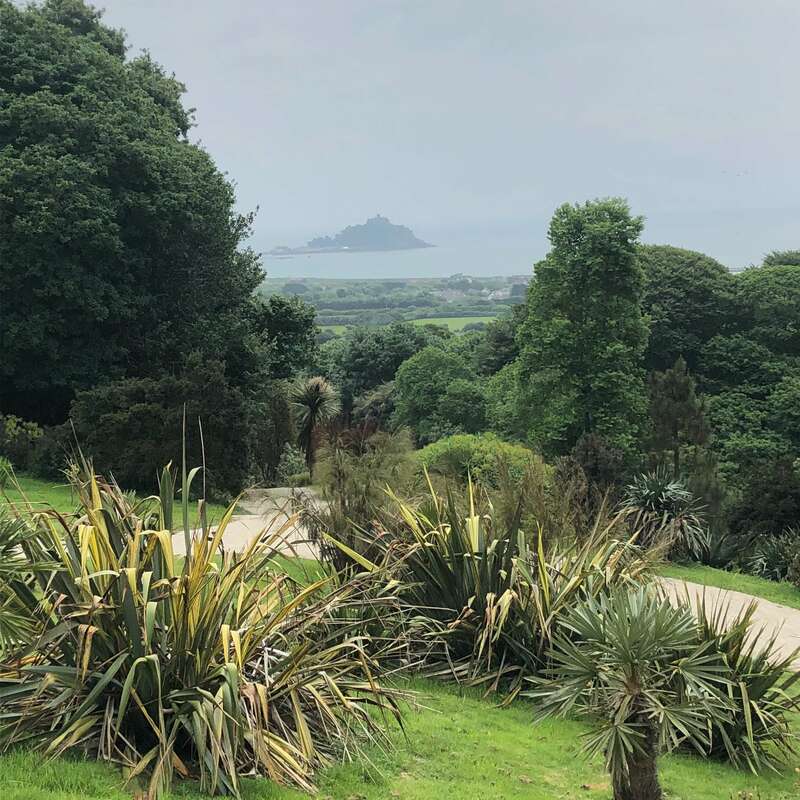 This 22 acre exotic and sub-tropical garden is surrounded by woods, streams and has an absolutely stunning view of St Michael’s Mount which is revealed as you scale to the top of the gardens. World-renowned artists like James Turrell and David Nash have created sculptures here which compliment the surroundings and it’s a really tranquil setting. We loved exploring the different elements of the gardens and it proved to be great exercise as well. Tremenheere is also dog friendly so you can take your four legged friend with you. This English Heritage castle stands overlooking the coastline. 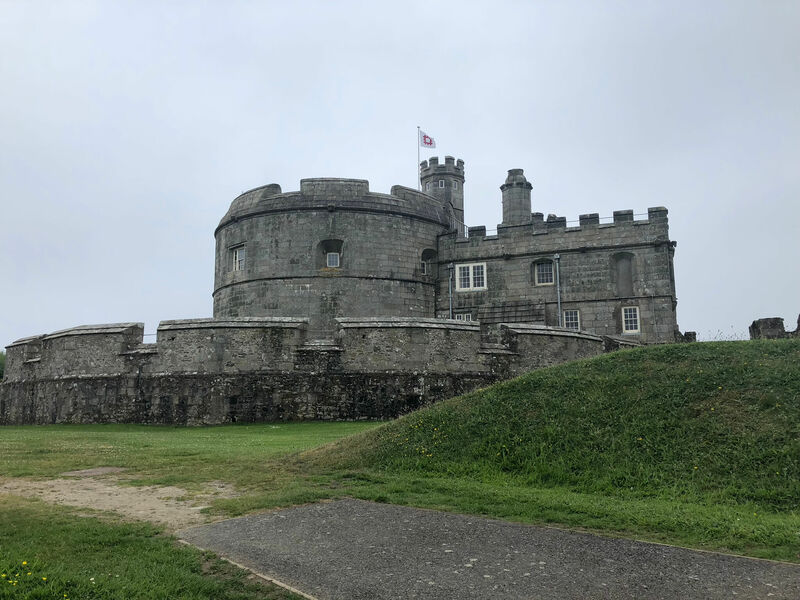 Pendennis Castle was one of Henry VIII’s finest coastal fortresses, built to defend against foreign invasion from the sea. There’s plenty to see and we spent a couple of hours exploring the different elements of the castle. There is the Tudor keep which has steep stairs inside into different rooms where immersive installations make you feel as if you are under attack. There’s also an exhibition examining the role of the castle in the world wars. 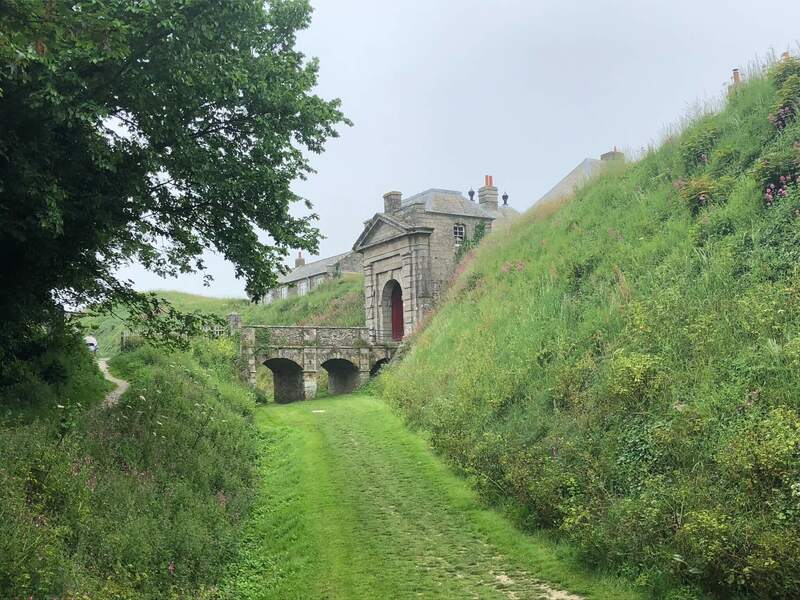 There is a hefty collection of cannons at Pendennis Castle which we were fascinated by and some of them even fire on some days! Obviously I’m all about the views and this one did not disappoint. There are stunning views over the coastline and the River Fal’s estuary. 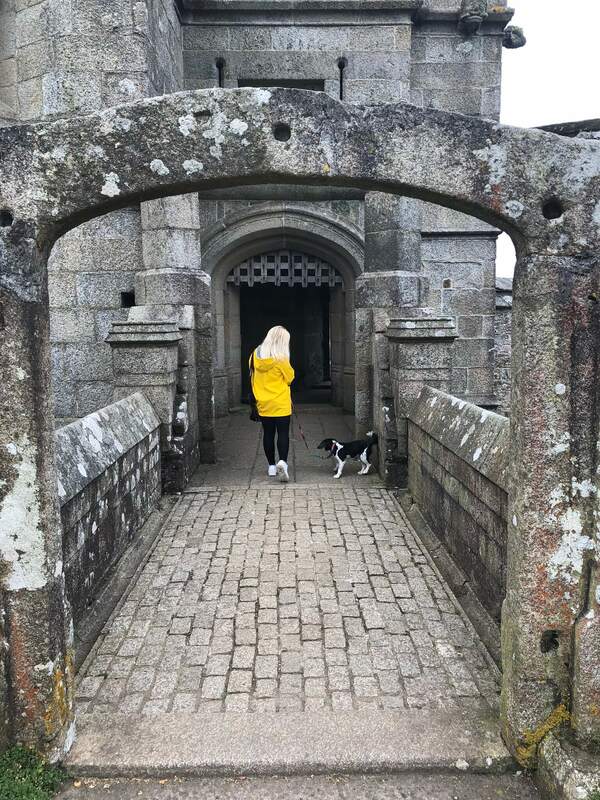 Following the castle, we did the walk around the moat (I believe you can do this without getting entrance to the castle) and walked down to the sea where we sat on a bench enjoying the views over the sea and a Cornish clotted cream ice cream. Falmouth has played a really important part in the maritime history of the UK and it was really interesting to find out more about this, and the role of the sea in history, at the National Maritime Museum. The museum is located in an iconic building whose design was based on that of the sheds of boat builders which used to be on this land. There are 15 galleries set over five floors and so there is plenty to see. 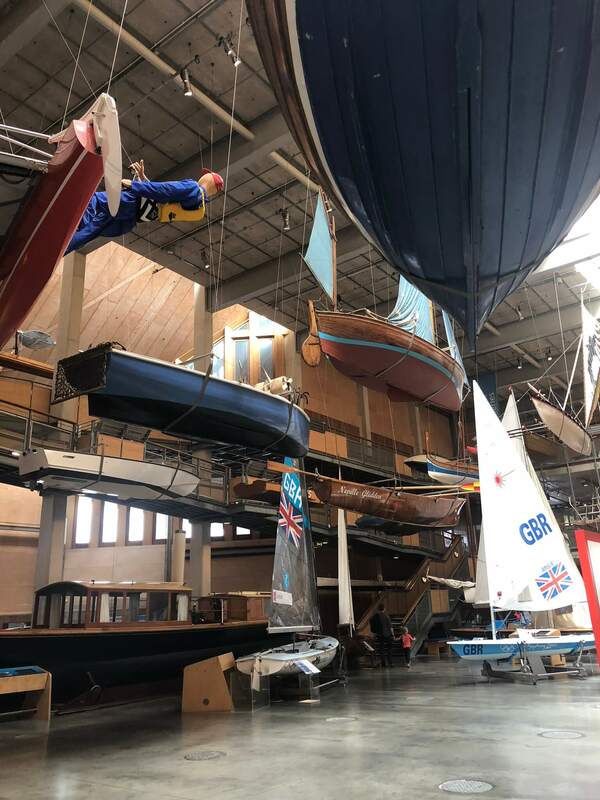 As you go in there are lots of actual boats and you can read about the history of each one of them – there’s even some of the Team GB Olympic sailing boats. 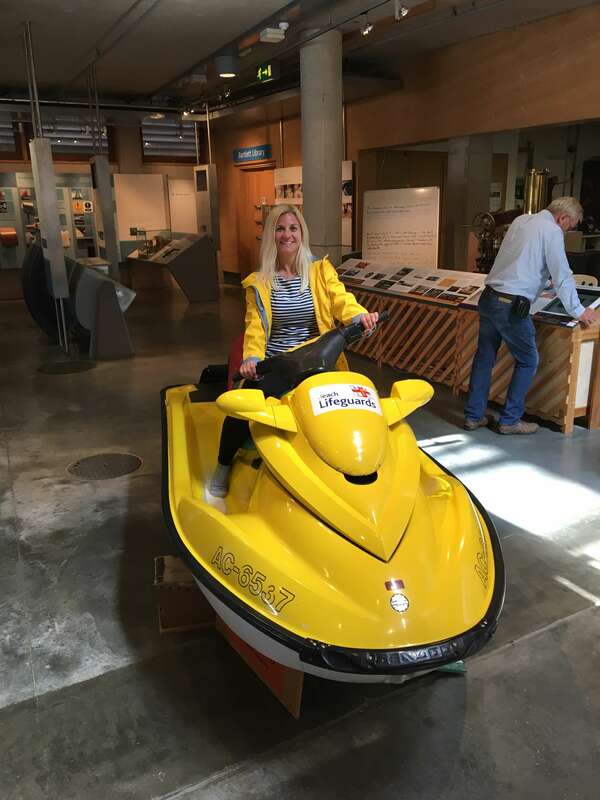 I enjoyed the survival zone best where I got to sit in a lifeboat and on a jet ski! Also, there were a couple of human survival stories there which were incredible. One was about a family who had set out to sail around the world but they ended up getting into difficulty and their boat sank. They spent something crazy like 60 days on a life raft and had to catch turtles to suvive. When they were finally rescued, the children found that they couldn’t walk as they had been sat in the same position and not able to stretch their legs for so long. I researched where to eat in Falmouth before we got there and The Shack won the award for the best Instagram pics. Their seafood platters looked incredible and seafood is my favourite, so I couldn’t resist booking a table here. 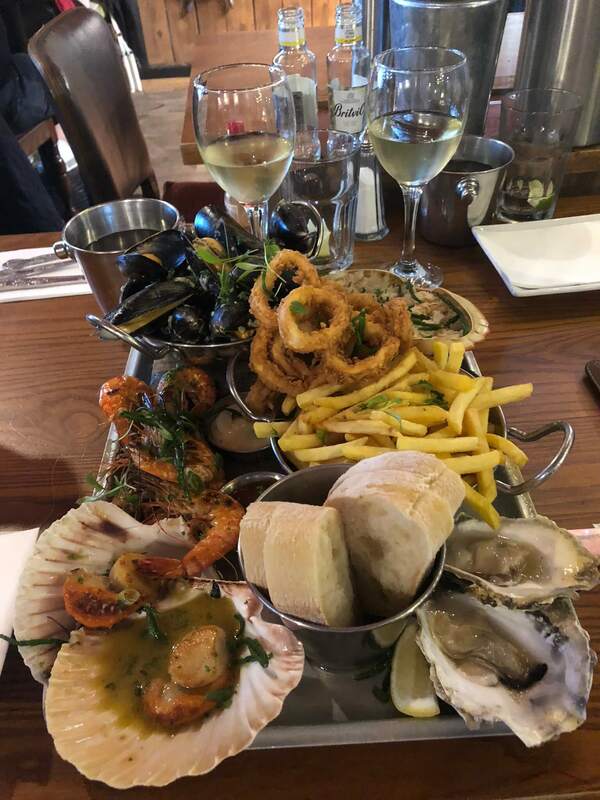 We shared a seafood platter which had dressed crab, scallops, oysters, prawns and calamari on it and was served with chips, bread, alioli and sweet chilli dips. We also ordered a bottle of white wine which was a perfect accompaniment for the seafood. It was absolutely delicious and I even enjoyed the oysters, which I’ve previously not been keen on. We were recommended the Gylly Beach Cafe by the B&B owners where we were staying at Highcliffe Falmouth and so we popped in for lunch. Although the weather wasn’t great, we still sat outside as the cafe overlooks the beach and I love eating with a view of the sea. It was so busy so I can imagine that on a sunny day we might not have been able to get a table. We went for a light lunch of sandwiches and I had the seafood cocktail which was super yummy. It was a mixture of crab, prawns, shellfish and crayfish with a perfectly seasoned lime coriander and chilli dressing. At night times, Gylly Beach does the firepit where you can choose to have food cooked outside. It looked really stylish and up-market so I was surprised that both the food and drinks were really reasonably priced. 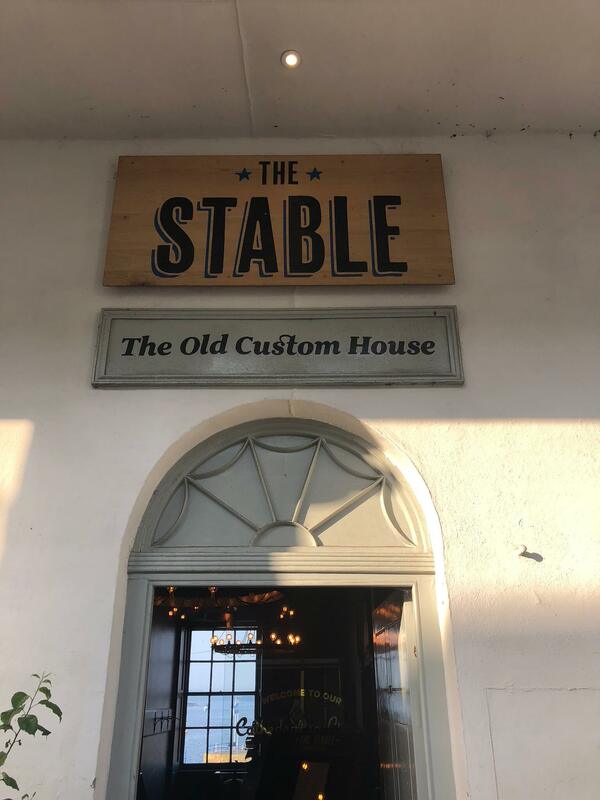 Pizza is my very favourite food and so The Stable was a perfect choice for our last evening in Falmouth. 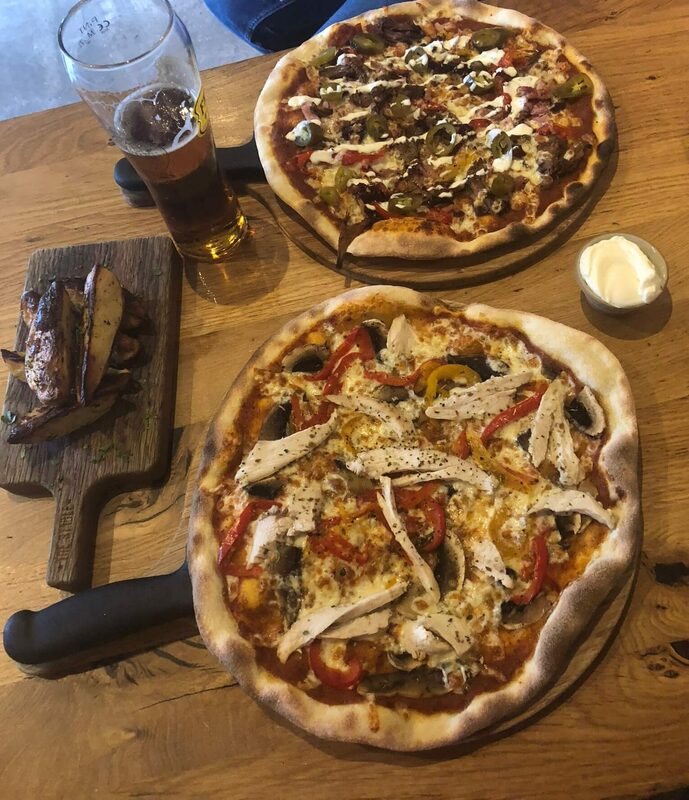 The Stable is a chain in the south west which specialises in sourdough stone-baked pizzas. Situated in a grade II listed building, the restaurant has views over Falmouth’s bustling harbour. We sat downstairs, as dogs are allowed downstairs in the bar area. 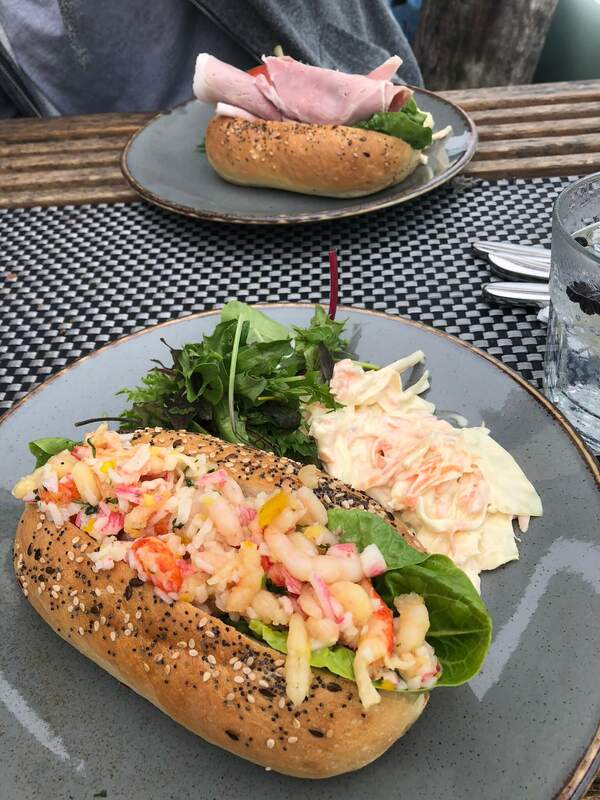 The downstairs of the restaurant is rustic – it’s all exposed brick walls and original wooden beams, plus there’s outside seating overlooking the harbour for when the weather’s good. It was really busy outside when we were there with a great atmosphere. We ordered drinks and the bar staff recommended a rhubarb and ginger gin which was delicious. I love it when the staff in a restaurant or bar are really knowledgeable about the food and drink so this was a massive plus point for me. In fact, a special mention needs to go to the staff in general as they were super friendly and attentive and they made a fuss of Alfie, bringing him treats. The pizza was delicious – I literally wolfed mine down! It had a lovely thin base and was topped with plenty of cheese and other toppings. I went for the pecking packet which is topped with chicken, peppers and mushrooms. The chicken was lovely and tender and tasted amazing with the combination of sweet peppers. 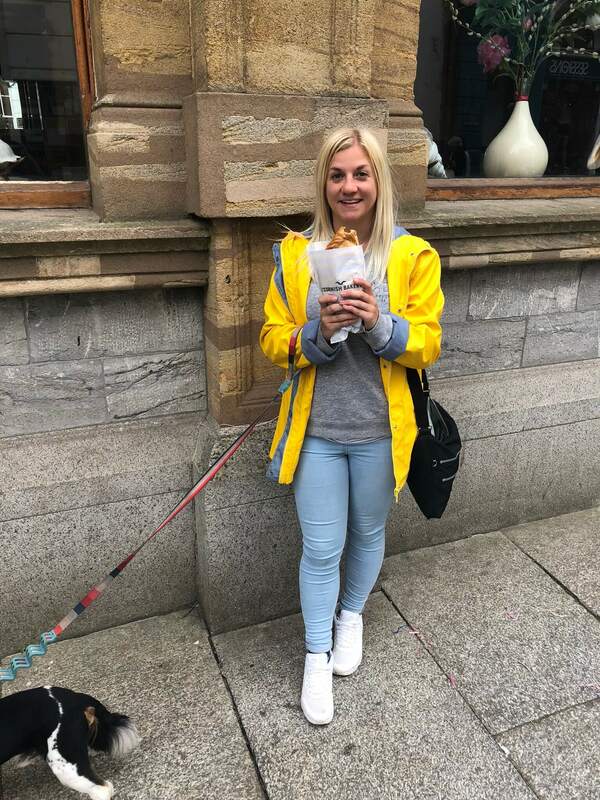 Of course, on our first day we treated ourselves to a delicious Cornish pasty from the The Cornish Bakery because…when in Cornwall! 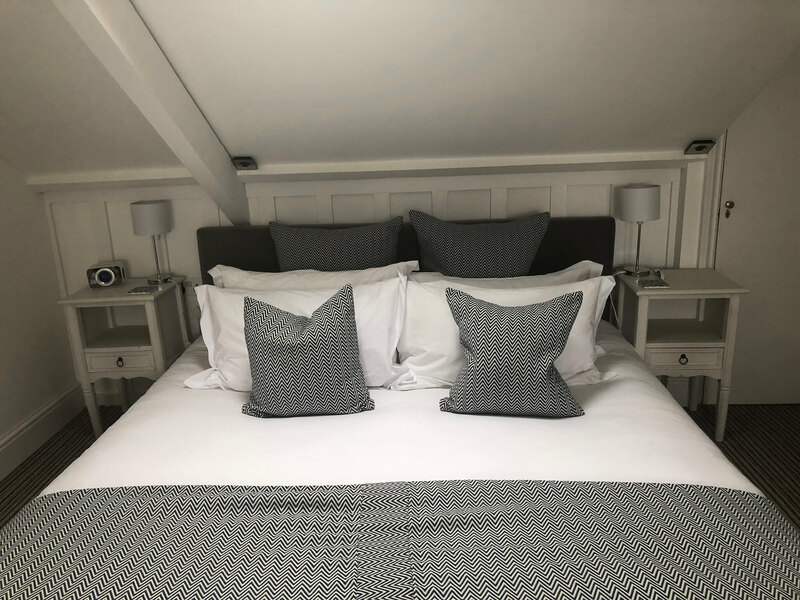 Highcliffe Contemporary Bed and Breakfast is rated number 1 for B&Bs in Falmouth on Trip Advisor and it’s not hard to see why. The B&B is run by Simon and Vanessa who really made our stay. They were absolutely lovely and literally could not do enough for you. The location is brilliant – just a five minute walk into the main areas of Falmouth and the hotel is designed to a really luxurious standard. 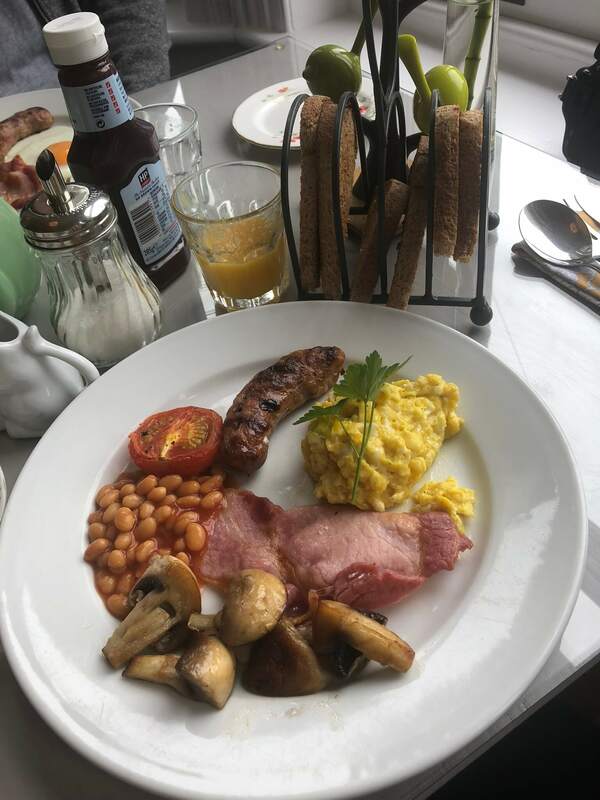 Downstairs is the breakfast room and the lounge which both offer a mix of contemporary decor with classic pieces and have a really relaxed, friendly atmosphere. We found ourselves chatting to other couples over breakfast. Speaking of breakfast…it was amazing! A lovely full Cornish with your choice of eggs and all the produce was locally sourced which I think makes all the difference. The scrambled eggs were some of the nicest that I’ve ever eaten. We stayed in one of the penthouse suites at the top of the building and our room was amazing. I loved how clean, light and airy it was. There was a sofa and TV for relaxing in the evenings and a HUGE bed which I never wanted to get out of, it was so comfortable! The bathroom was super stylish with a Waverley sink and a large walk-in shower. We loved the little touches in our room too – the keys to our room had a little bird whistle on them which lived in a little house next to the door while you were in the room, and the toiletries were super lux. But the very best thing about our room was the incredible sea view. From the large velux windows we could see over the rooftops of the town and down to the harbour – the kind of views that dreams are made of.